Phil Hughes has The Roar community divided; some have written him off, while others (like myself) think he will be a dominant Test match opener. 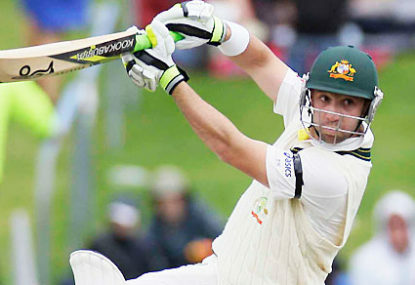 The biggest argument against Hughes is he’s been tried, tested and failed at Test level. Certainly the tried part is true as he’s accumulated over 20 Test caps, but let’s not forget the kid just turned 25 and is still refining his game. He has improved his play against pace and now he must do that against the spinners. Hughes had a horrible tour of India and England because of his weakness against spin but this was exaggerated as he was batting out of position. Hughes is an opener and that’s where he should bat. Until he improves his game against spin he needs to start his innings against the pace men. Let’s also remember Hughes’ Sheffield Shield batting average is in the top 25 of all time for Australian batsman, bettering the average of some of the all-time greats in the likes of Allan Border, Justin Langer and the Waugh brothers. In the modern era only one player ahead of him on this list didn’t go on to a become a great Test match batsman – Michael Bevan. Unfortunately for Bevan he got stuck behind some of the best batsmen we have ever produced and only managed to play 18 Tests early on in his career. Fortunately for Hughes he won’t suffer from the same dilemma because there is a shortage of quality batsmen going around and it’s only a matter of time before he gets another crack. So obviously he will improve, but by how much? Let’s have a look at his Test stats so far. In 26 matches he has a batting average of 32.65. To get an answer to the above question I wanted to check and compare Hughes to players who had also played 20 Tests before the age of 25. Two players stood out – below is their Test match stats before they turned 25. Steve Waugh, in 44 matches had a batting average of 37.44. Michael Clarke in 27 matches had an average of 42.00. Clearly both records are better than Hughes’, although Steve Waugh was only five runs better at the same age plus he had played 18 more Tests. Clarke has averaged 55.76 since turning 25, an improvement of over 13 runs, and Steve Waugh averaged 54.51, which is an improvement of more than 17 runs per innings. So again, how much can Hughes improve? Well considering his unbelievable Shield average and the fact Steve Waugh and Michael Clarke overcame a very similar start to their careers, I would say the odds are in his favour of becoming a pretty good Test match batsman. At the very least he should be able to add 10 runs to his current average, pushing it above 42, but If he can bump it up as much as Waugh did he would be averaging something close to 50. My guess is he will end up with an average somewhere in-between those two figures. Clearly Hughes’ skill level hasn’t even peaked yet and as far as I’m concerned it’s only a matter of time. Let’s not forget about Phillip Hughes just yet.